The independent Atlantic League team the Lancaster Barnstormers has made a production out of two brothers Blake and Gavin Glass who ask Barnstormers players probing questions such as Who Looks At Themselves In The Mirror The Most and What Is The Best Pickup Line To Use On A Girl. The videos are pretty funny and the players, which include former big leaguers T.J. Beam, Fernando Seguignol, Jonah Bayliss, and Butch Hobson, as well as many minor league veterans you might recognize, are all great sports and offer some pretty humorous responses to the questions. In addition to being awesome kid reporters, Blake Glass and his brother are also apparently awesome kids. Our friend Jason Bristol sent us the link to THIS STORY he did on Blake, the older of the two boys. It turns out that Blake has a condition called Alopecia areata which causes him not to have hair on any part of his body. He turned his autograph collecting passion into a fundraiser, donating a nickle out of his allowance for every autograph to the National Alopecia Areata Foundation through his project Autographs 4 Alopecia. In the first video below you can watch the story on the project and below that you can view some of his and Gavin’s awesome work as the Barnstormers Kid Reporters. 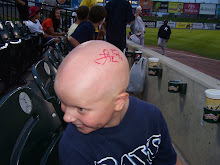 You can visit Blake’s website Autographs4Alopecia.com and Like Autographs 4 Alopecia On Facebook. 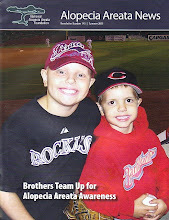 The two brothers are also holding a Silent Auction at tonight’s Barnstormers Game to raise money for the foundation. If you use twitter or facebook, be sure to retweet or share this story via the buttons above and help spread the word about these young men and their Autographs 4 Alopecia cause. UPDATE: The brothers raised $726 during their auction. Blake getting advice on the ladies!